It’s tiny. It’s battery powered. It costs just over US$300 street. 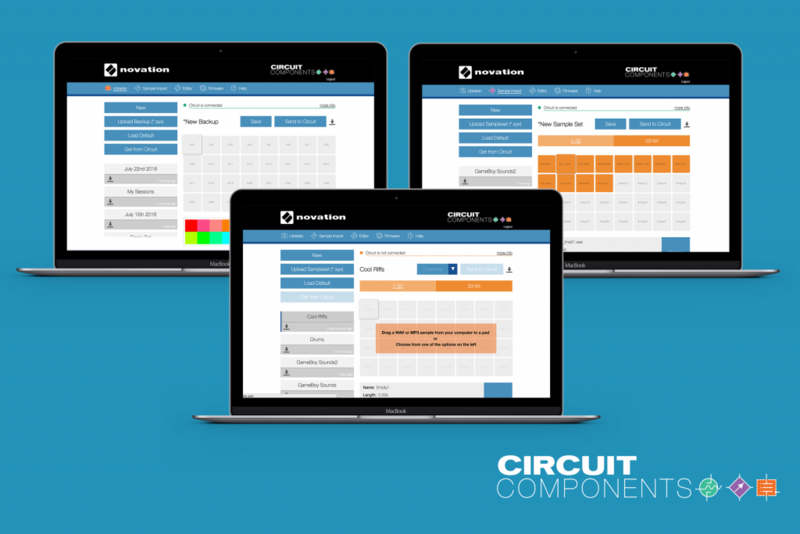 But Novation’s Circuit sample/drum/synth groovebox has been squeezing in a whole lot of functionality that makes it into a really serious tool, great for starting ideas or jamming or playing live. And we’ve been testing the latest build, version 1.3, for some days now. It’s available to everyone free right now, and it adds some significant changes that make this tool more flexible than ever. Let’s have a look. Here’s what’s new in the free 1.3 firmware update (and accompanying Web tool updates), available right now. In short: think samples. You can use samples per step, not just per part. Now each of the four drum parts can contain different samples. Novation calls this “Sample Flip” – but basically it just means when you change the active sample, you can do it per step and not just the whole part all at once. There’s a lot of other functionality packed into the implementation. It makes sense to call this a “flip” in that it’s an event – you can record those changes as automation, you can duplicate them to other steps (even across paired parts 1/2 or 3/4), and macro and sample data are carried with the step when you copy. Separating the samples from the sequence is fun, too. Start with a sequence, then change the sample on the fly. Or do it the other way round: start with a series of sample changes, then record in a sequence on top of it. And that all means some creative ways to generate and transform ideas. You can play samples from the grid directly. 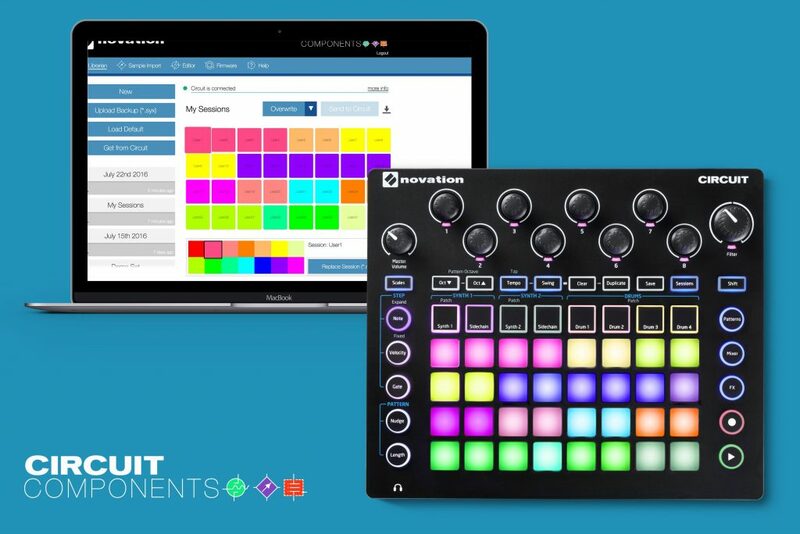 Novation calls this “Sample Preview” or “auditioning,” but it’s really more than that — it’s the ability to play samples from the grid directly. So you can trigger one shots or play out of the confines of the step sequencer and you can play and improvise live, as well as, yes, hear what samples sound like on the grid before you record a sequence, etc. It’s something you’d expect of a sampling drum machine, of course, but it’s now available from the ultra-minimalist, ultra-portable Circuit, too. Play longer samples. Up to all 60 seconds of playback can now be triggered without fading out, if you really want to do that. Colors! You can assign colors to sessions. Download and backup sessions individually. You can back up and manage individual sessions, not just batch 32 of them at a time. Backup now includes samples, not just sessions. Everything is up on the cloud. Rearrange samples on the grid. This makes it easy to group samples and organize them so you remember where they are (which, without labels, is essential). So now, once you add samples via the Web interface, just drag them around to reorder them. Save as new… Create variations of sample sets and backups quickly. A better, more consistent UI. Librarian and Sample Import each now have the same UI and workflow. And the UI has been improved overall. And there’s a new UI for managing backups and sample sets. The whole thing is far more powerful. Components still requires Opera or Google Chrome / Chromium, and still requires an active Internet connection – I’d love to see an offline version for certain functions. But for now, I’ve been fine doing my management with the Internet on, then working with the Circuit without it off on a gig. Also still not in this update is the ability to drag and drop multiple samples at once; I keep asking for that, and I hear it is on the roadmap. But this clearly moved the Circuit from the pre-1.1 “ah, nice cool toy” to 1.2 “wow, this could become one of my main tools” to 1.3 “ah, wow, now I’ve almost no excuse not to use it as one of my main tools.” And seriously, I wouldn’t be saying that if it had just popped into my head; I’ve been talking to other Circuit users and been really blown away by how much they’re doing with it.